Abe’s peaceful retirement was shattered when visited by a vision from the Three Weirdos. Abe learned the Magog Cartel was mining Necrum, the sacred Mudokon city of the dead, to collect bones to make super-addictive SoulStorm Brew. After freeing the Mudokon spirits imprisoned in the Mudanchee and Mudomo Vaults, Abe gained scary powers from the Weirdos, including the ability to heal his Mudokon friends of SoulStorm addiction, and the power to turn invisible. Infiltrating the transportation hub of FeeCo Depot, and using explosive farts to survive adventures at the Slig Barracks and Bonewerks, Abe broke into SoulStorm Brewery. There Abe learned the truth behind the secret ingredient of SoulStorm Brew... just before blasting the place to atoms with the combined power of the sobered-up Mudokon he’d rescued. Then Abe joined his brew-addled pals at Alf’s Rehab & Tea to take the cure – the journey of a lifetime starts with one step. 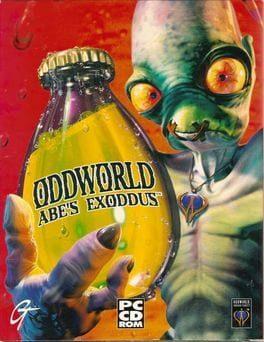 Oddworld: Abe's Exoddus is available from 2.99 to 5.69 from 1 shops.